Wong Fleming is proud to announce that Rafeeq Rahiman has joined the firm as a Partner in its Washington, DC office. Mr. Rahiman earned a LLB degree from University of Birmingham, UK. He is admitted to practice law in District of Columbia, New York, England and Wales. 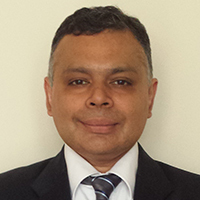 Mr. Rahiman concentrates his practice in E-Discovery, International Law and Project Finance. Prior to joining Wong Fleming, Mr. Rahiman worked for one of the largest firms in Washington, DC on some of the largest oil, telecommunications and aviation mergers involving several billion dollars. He has expertise supervising and managing teams of contract and project attorneys in the discovery phase of merger investigations. Wong Fleming is a nationally recognized, AV-Rated law firm that represents Fortune 500 companies and other corporate clients in the areas of Commercial Litigation, Employment Law, Real Estate, Intellectual Property, Corporate Asset Recovery, and Creditors’ Rights and Bankruptcy. The firm maintains offices in New Jersey, Pennsylvania, New York, Maryland, Washington, D.C., Georgia, Washington, California, Florida, Texas, Canada, Mexico and Germany.